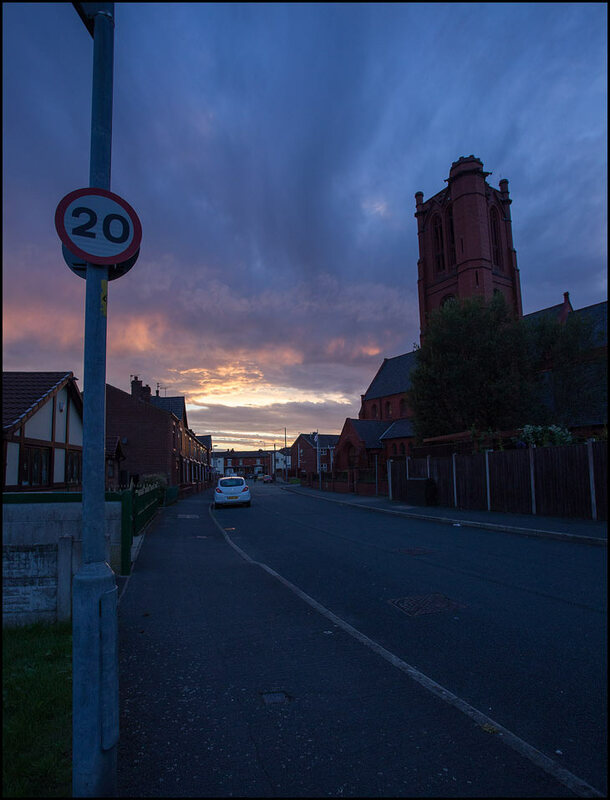 New speed limits are being introduced across the town - this went up at the bottom of our street recently. Set against a superb sunset. I was out on my bike a couple of weeks ago and I bought a pie in Hindley and it was still warm by the time I got to that street Platt Bridge. I also went into the church hall because there was a second hand sale on. But will the young drivers obay these new speed restrictions. I say young drivers because they are the speeders...male and female. It should be 21 years of age to pass a driving test today. For once I have to agree with you Garry ! Here where I live 20mph speed signs are quite normal....and most people abide by them. They are usually through villages with narrow roads & tight bends but I have my doubts wether young drivers abide by them....& there will be an upsurge in hearing aid wearers soon, you can hear the throb of the music before you see the car ! another beautiful sunset. beauty can be seen anywhere can't it? You just need to open your eyes. For once I have to agree with you Helen! Some of the young drivers radios/CDs are that loud, they can't hear the emergency services trying to get through traffic...every second counts. In my experience its not the young drivers its the foot down in second gear mothers who dont take notice of any traffic signs. Where these speed restrictions have already been implemented the usual idiots still drive as though they are competing in a rally. The drivers of Bluestar taxis are over twenty one Garry, and they are all excessive speedsters and far worse than the boy/girl racers. Great picture. As bad as the motorists are the people who ride bikes on the pavement next to main roads. They go at ridiculous speeds and give no warning that they are behind you. If you suddenly moved towards the pavement in order to cross the road you would have no chance with the speed they go at. Some people seem to want to take us back to the dark ages. Cars have never had better brakes, etc. Yet some want us to dirve as if we're still riding around in Morris Minors. What next? Back to horses and carts? The needs of the many should outweigh the needs of the few. Today this has reversed. Crazy! Pie still warm Mick? You must have broken the 20mph speed limit!!! The 20mph also means that we will hear the excessively noisy music(?) for a little longer! Kath, I just love your optimistic view of everything - and I agree with you. We often look but don't see. Nice shot Andrew. I have to respond Sandra. Brakes only work as well as the experience of the driver behind the wheel...& a child can be killed at 30mph or less. Nothing to do with going back to the Dark Ages at all. Sandra, You would soon change your outlook on driving at speed if you hit and badly injured or killed someone, or if you, your child or other family member were to be hit by a vehicle exceeding the speed limit. Speed Kills. Twenty is Plenty. I am sorry but I have to agree with Helen. A car is only as safe as it's driver. I myself and would welcome a 20 limit in my quiet road here in the West Midlands. Sometimes I think that Thunderbird 2 is going down the road. Sandra, you drive with the conditions ie, if it says 20MPH you obay it. Of course brakes are better, everything on vehicles are better these days...but some drivers are NOT. Twice now, I have to agree with Helen, at 13:26. I bet Sandra's got points on her driving Licence, if she has one. There is a 20 outside as we don't live far from a High School and a Infants and it is as useful as a chocolate fire guard ! That's the whole point, Gareth. Great photo Andrew. Beautiful church, I can just see my Grandma and Grandad going in there. Thanks for posting. No points on my licence that I've held since 1966. The country has gone soft. Its crazy pedestrians that cause the problems not most drivers nor speed. By the vey nature roads are bound to be dangerous places. Crossing them is a risk we just have to take. Railways segregate the public from the trains, but it still doesn't stop idiots getting killed by trains. Until pedestrians are totally segregated from roads there'll always be accidents. Pure commonsense. Rev David the sky as nothing to do with Andrew its god who created that lovely look. Sandra has it spot on,instead of blaming the car drivers for everything from statistics to melting ice caps, the little buggers need some basic training to teach them how dangerous all types of vehicles are from push bikes to inter city trains. They are being cosseted so much these days that they have no perception of DANGER of any kind. They have absolutely no road sense and you only have to stand by any pedestrian crossing for five minutes to see first hand how the twerps think that they have the God given right to dash out into the road and every one has to stop just for them. I bet that at least 85% of bumps are just as much the persons fault as the drivers. Stop putting ALL the blame on the drivers and educate the buggers by standing them in the middle of a dogem ride, before all wheeled transport gets slowed to a crawl or banned altogether. In response to Sandra. There is nothing sensible (common or otherwise) about the suggestion to segregate all pedestrians from roads. As a retired HGV driver I have seen at first hand the appalling driving standards of some of todays drivers. When we pass the driving test we agree to abide by the rules set down in the Highway Code. If the sign says 20mph, then that is the speed you should travel at. If you get caught breaking the speed limit, or any other traffic offence, don't start bleating about how everyone is out to blame the car drivers like owdkewyed suggests. Hold your hand up and admit you've done wrong. Whilst I agree with Sandra, that modern cars have better brakes, you would have to have the reactions of a Formula One driver to stop any car when someone steps out from behind a parked car when your doing 30 or 40mph. Far better to have more reaction time by travelling at a lower speed, unless Sandra's car does the braking for her? Finally, lets not forget, these new speed limits only apply to built up areas, on housing estates and near to schools. On Motorways and main roads you are free to travel as fast as you like (within the speed limit), safe in the knowledge that your modern car will stop safely no matter what speed you are doing or whatever the road or weather conditions are like. Apologies to Andrew for my last rant. What I really wanted to say was, Brilliant picture Andrew, fantastic sky.